Introduced to the UK by the Normans over 1000 years ago, Fallow deer (Dama dama) are widespread across England and Wales with numbers in 2010 studies approaching 300000 animals. In winter, the coat has no spots and is dark grey. In some regions there are deer which are pale brown with spots (menil) as well as both black & white varieties. October is the most exciting time to see these animals because this is the time of the rut – (fierce mating battles). Generally this species of deer lives about 15 years though some have been recorded reaching more than 25 years of age. Fallow deer can be seen all over the estate here at The Vyne though perhaps most frequently around the Water meadow and perimeter of Morgaston woods. 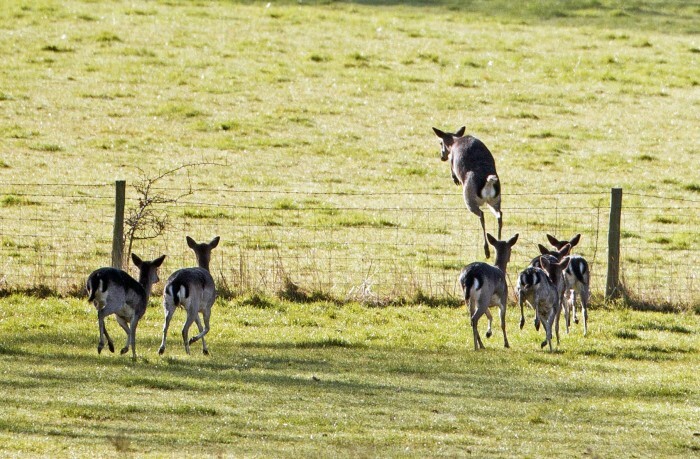 Fallow deer can easily clear obstacles of 6 feet or more especially when spooked. Copyright – James Meikle.